Taken from http://www.violinist.com I could not find a way to contact the author directly, but I will keep searching. Please visit the site for the original article by Laurie Niles. The website has been VERY helpful to me as an orchestra teacher (I taught middle school orchestra for 6 months). Please check the site out! If you are new to the violin, you might be tempted to buy one of the low-priced violins advertised all over the Internet – by low-priced I mean anything under about $300. Having a cheap violin will make an already-difficult skill even more difficult to learn and will cause persistent frustration in your practice. Your violin will refuse to be in tune, the angle and placement of the strings will be off, the tone of the instrument will be squeaky and unappealing, and the tuners will likely bend and break. This year has seen a flood of cheap, factory-made violins from China, priced impossibly low. This low price point makes a $400 violin seem like a bad deal, but this is actually a reasonable price for a student violin made from good-quality wood with a fitted bridge, fitted pegs, etc. How can you tell the difference between a quality fractional-sized or full-sized violin and a substandard “violin-shaped object,” or “VSO”? One fairly reliable indicator is the fingerboard. Is it made from ebony? Ebony is the best wood for violin fingerboards, and it is naturally black. A VSO typically has a fingerboard made from a light wood that has been painted black, said Tom Metzler of Metzler Violin Shop in Glendale, Calif. 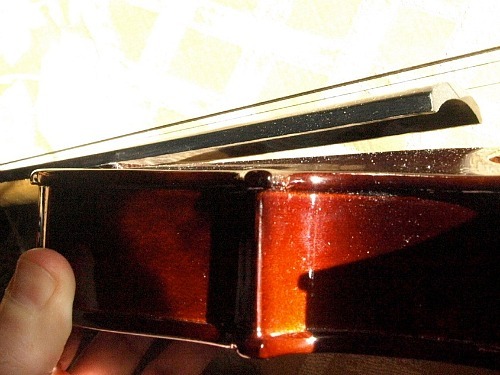 If you turn the instrument at an angle, you can check for brown patches on the underside of the fingerboard, close to where it has been attached to the fiddle. If you find brown patches, that is one indication that the fingerboard has been painted, and that it is not ebony. If you look underneath this violin fingerboard, you will see the “unpainted” patch. That fingerboard is definitely not made of ebony! When the fingerboard has been made from cheaper wood that isn’t ebony, it is more susceptible to warping, which causes the fingerboard either to be curved upward, or to have a counter-curve, making it more difficult to play. It can also cause rattling and squeaking, if the string vibrates against the fingerboard. The cheap VSOs generally come with one-size-fits-all bridges that are rather thick and squarish. 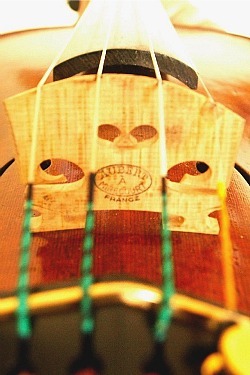 A quality violin has a bridge with feet that are individually fitted to stand properly on that specific violin. If you look at the feet of the bridge and there are gaps underneath, the bridge probably was not fitted to the fiddle. This can cause instability, making the bridge fall down more easily and also making it lean instead of stand upright. The top of the bridge should be arched and sloped down to the E-string, to create the proper angle for the bow to touch each string. In a VSO, this often is not the case, the strings may be on a simple, non-sloping arch or possibly almost like a row. If all the strings site straight in a row, it’s very difficult to play on one string without hitting another. This business with the angle of the bridge is more important than you might think; you feel it constantly when you play. If the angles are well-calibrated you will feel an ease in crossing strings; if not, there will be persistent frustration. A poorly-made VSO bridge, on the left, and a properly fitted bridge that slopes down the E string, on the right. Having the feet of the bridge sit “just so” on top of the violin makes a significant difference in the sound of the violin, the way it transfers into the belly of the fiddle. Another sound issue can involve the sound post, which is rather hidden from view. 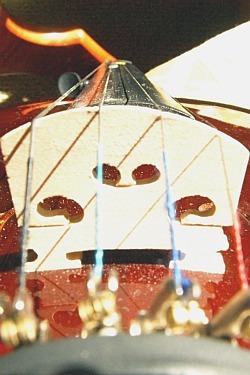 The sound post sits underneath the right side of the bridge, inside the violin, and is critical in transferring the sound from the vibrating strings into the violin. It is important that it fits just right and that it stays standing. Unfortunately, in a VSO, “usually they are cut far from the mark, fall over easily and don’t transfer the sound properly,” Metzler said. If the bridge is too high, it raises the strings too high. When you are pressing your fingers down on the strings, high strings can feel very uncomfortable and also hinder the speed of your fingers. If the strings are too low, they can vibrate against the fingerboard, causing undesirable squeaking and rattling. Another question to ask: Is the purfling simply painted onto the violin? 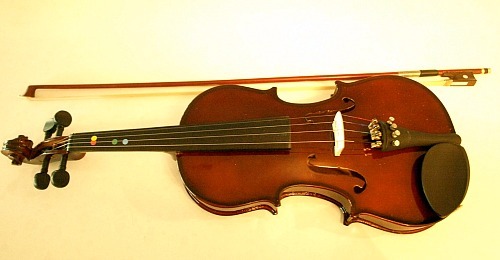 The “purfling” is that little double line that traces the shape of the violin. It’s supposed to be a thin layer of inlaid wood, which protects the body of the violin. If a maker has “cut corners” here, it’s likely that other details have been short-changed. Also, the neck may not be carved – someone with more violin experience would be able to tell if a neck is not carved from simply feeling it. The un-carved neck on a cheap violin might work all right in the beginning, but as soon as the student starts using higher positions, it can cause awkwardness and hinder a student’s ability to work well in higher positions. You can also look at the label. Generally, a good-quality instrument has a label inside that says who made it, where it was made, and in what year it was made. You can find the label by peeking inside the left “f” hole. VSOs often have no label at all. To be fair, some finer violins also have no label, but it’s another thing to check. Let’s talk about pegs, which hold the strings in place and are turned when tuning the violin. In a good violin, pegs are made from boxwood, but in a VSO, they are often made of soft brown wood and “often they will break off in your hands,” Metzler said. I have personally had this experience, of tuning a student’s instrument and having the peg simply snap off at the base. There’s no cure, other than a new peg. The pegs also fit into holes in the peg box, and if the holes are not exactly the right size, the pegs will either slip, or they will stick. The strings that come with a VSO tend to be the first thing people notice that is bothersome. They tend to be steel and tinny-sounding. Be prepared to spend between $25 and $50 to replace them, first thing. Looks can be deceiving, when it comes to violins. A new, shiny violin may well be a VSO. I’d much rather have a somewhat beat-up old Suzuki Nagoya, with a good tone and good craftsmanship. That said, you can find good violins that are new, as well. Though most VSOs are Chinese, not all Chinese-made instruments are bad. In fact, “there are lots of really good student instruments, and 95 percent of them are Chinese,” Metzler said. Some of the better brands of student instruments include old Suzuki violins from Japan, new Suzuki violins from China, Scott Cao, Yamaha, Vivo, Angels, Eastman, Century Strings – there are plenty more. But buying a violin online, without testing it, is a risky way to go. If you take a chance on a cheap violin, you may well spend an additional $200 upgrading the strings, getting a better bridge, getting an appropriate sound post – and then you still may not like the way it sounds or feels! I’ve heard the argument that “I’m just experimenting” or “My child may not like it, so I don’t want to make a big investment” to justify buying a VSO. This is a false economy, and I will tell you why: if you are stuck with one of these grossly substandard instruments, you (or your child) will not want to play it. You may not even be conscious of the reasons why you find yourself not liking the violin, but it will be a combination of being displeased with the tone, sometimes even finding the sound of the instrument painful, being unable to tune it, having parts break off, the feel of a cheap violin that doesn’t really fit in the hand, the visual ugliness of something cheaply made, and the overall bad feeling of having an object that was not made with care. Conversely, if you buy or rent a well-made violin, you will enjoy its pleasant tone, you will enjoy the way its mechanics support you, the way it fits in the hand and the craftsmanship behind it. A violin shop will usually allow you to test a violin before buying or renting it; this is usually possible even when you are renting from an out-of-town shop. If you have a teacher, enlist your teacher’s help in selecting a good instrument. For all of these reasons, I would urge you to consider renting or buying a violin and not a Violin-Shaped-Object. This entry was posted in Informational, Instruments, Instruments, Teaching Orchestra and tagged bass, cello, ensemble, laurie niles, middle school, orchestra, school, the violin site, theviolinsite, viola, violin, violin shaped object. Bookmark the permalink. So true. My first violin only cost me 70 dollars and it was more to convince my parents and me that I could learn it. A year later I upgraded to my present violin, and it was amazing how quickly my technique improved on the better instrument. Yes get a good instrument to start! Thank you for commenting! It will save a lot of time, money, and frustration to simply buy the better instrument the first time; at least get something decent!